During Sunday night’s Golden Globe awards, Carell presented the first ever Carol Burnett Award for outstanding achievement in television to, appropriately, Carol Burnett, and the denizens of Twitter dot com lapped him up with the unquenchable thirst of people who had been wandering, lost in the arid desert of Old, Dorky Steve. Steve Carell could without reservation get it. 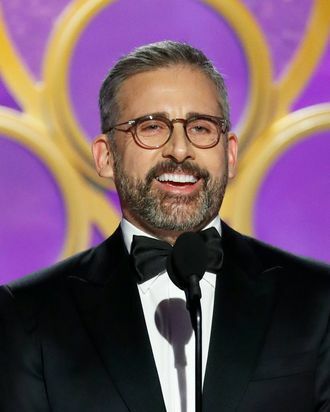 grateful that we as a culture all want to bang silver fox, concerned daddy steve carell. The former Office actor, who starred in three films in 2018 — Vice, Beautiful Boy, and Welcome to Marwen — inspired similar displays of unbridled horniness back in October, when he was photographed for Esquire looking like your hot creative writing professor.